How long will data be stored in CaltechDATA? In most cases, indefinitely. Any data that violate the Terms of Deposit or which fails to meet minimum standards for retention may be withdrawn. For example, we may eventually remove deposits that consist of unusable/obsolete files or are inadequately described. Files that are larger in size may have higher standards for retention. The DOI for all records will be retained and will lead to a tombstone page listing the reason for withdrawal. Who can upload files to CaltechDATA? What can I upload to CaltechDATA? You can upload any digital files to CaltechDATA. You can also directly import software from Github for long term preservation. Publications should be submitted to CaltechAUTHORS. Is there anything that can't be deposited to CatechDATA? How much data can I store on CaltechDATA? There are currently no hard storage limits, but you should only deposit data that will be useful to others. All data must be described in sufficient detail so that others can understand it. If you're planning on uploading more that 500 GB of data, please data [at] caltech.edu (subject: Uploading%20Large%20Amounts%20of%20Data%20to%20CaltechDATA) (contact us) first. Does CaltechDATA have any file size restrictions? No, but file size can impact the availability of files. Files under 1GB will always be immediately available. Files under 100GB may be immediately available only if they are accessed every four months. Otherwise files may be stored on Infrequent Access Storage (IAS) and may take up to 24 hours to retrieve. How do I access my CaltechDATA files in Infrequent Access Storage(IAS)? Currently no files are stored on IAS. When this feature becomes active, instructions will be provided. Can I make my files in CaltechDATA private? Not indefinitely. You can embargo data for a specific period of time, but all data must be intended for public access at some point in the future. Can I restrict data in CaltechDATA to specific users or groups? Does my data need to be published before uploading to CaltechDATA? No, you can upload unpublished data. If you wish, you can embargo the data until publication. You can easily link your data to publications by entering the DOI in the related publications field. What metadata fields are used in CaltechDATA? What can I do with data in CaltechDATA? You can use the read API to load files in CaltechDATA into another application. For example, the web application at plots.caltechlibrary.org allows you to interactively plot two mineral spectra files (https://data.caltech.edu/records/208, https://data.caltech.edu/records/209). You can see the api code that generates this demo at https://github.com/caltechlibrary/caltechdata_plot. Feel free to send us an email at data [at] caltech.edu if you'd like help integrating the repository with your application. Is there any charge for storing data in CaltechDATA? CaltechDATA storage is provided by the library at no cost in most cases. Users planning on depositing more than 500 GB of data should email us at data [at] caltech.edu to discuss your requirements. Can I make changes to a record in CaltechDATA? Yes, once you're logged in you should see an edit button appear for all records you created. This allows you to edit the metadata in the record. If you need to change the files associated with a record, send us an email at data [at] caltech.edu. How do I use the CaltechDATA API to create records? Does the CaltechData repository provide private links for journal peer reviewers to use before publication? A peer review access password/link is the most requested feature for CaltechDATA. Our development partner is working on implementing the feature, but we do not have a schedule for when it will be available. For now, we recommend submitting the files to CaltechDATA with an embargo. This will generate a permanent DOI link that you can include in the paper text or references. The reviewers will be able to follow the DOI and see that the files have been uploaded, but they will not be able to download the files. You should upload the files to a sharing service like box.com, where you can generate a link (or password) that you can provide the reviewers so they can access all the files. How do I get a DOI badge on my GitHub repository? First submit your software to CalechDATA, or Zenodo if you're not affiliated with Caltech. 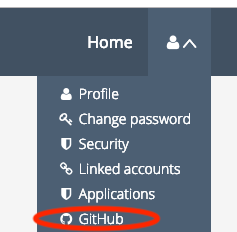 Once you log in, select GitHub from the profile menu in the upper right hand side of the screen. You'll need to enter your GitHub credentials and then select the repository of interest (You might have to refresh the page for the buttons to activate). Your software will be preserved only when you make a release in GitHub. Different formats of the GitHub badge will appear on the GitHub section of CaltechDATA or Zenodo once you make your first software release. If you want the DOI badge to appear with your first release, find your Github repo id at: https://api.github.com/repos/caltechlibrary/ames (swap out your repo name). The badge will not appear until you make a release in GitHub and a DOI is assigned. Who should be listed an an author in CaltechDATA? The authors of a dataset are "The main researchers involved in producing the data", according to the DataCite specification. The authors listed in CaltechDATA do not need to match the authors in a related publication. You can list other individuals who assisted with a research project as contributors. How can I test making records in CaltechDATA? You should not conduct testing in CaltechDATA, as submitting a record will automatically generate a DOI that cannot be deleted. We have a separate instance for testing - send us an email at data [at] caltech.edu so we can set up a test account for you. How does CaltechDATA ensure that files will be available over time? CaltechDATA is designed as a long-term data repository and it is expected that data will be available for the foreseeable future. This service is run by TIND and managed by the Caltech Library, which has a decade-plus history of preserving and making digital content available online. All records are assigned a digital object identifier (DOI), which provides a persistent machine-readable web link to the data set. All data is preserved using the OAIS reference model and multiple copies of all files are stored in different locations using varied storage approaches. How do I preserve a GitHub repository in CaltechDATA? 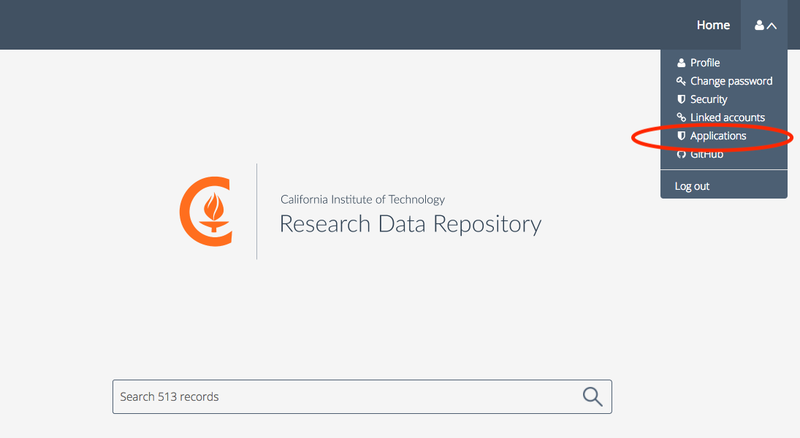 Log into CaltechDATA with your Caltech (access.caltech) account credentials. Then select GitHub from the profile menu in the upper right hand side of the screen. You'll need to enter your GitHub credentials and then select the repository of interest (You might have to refresh the page for the buttons to activate). Your software will be preserved only when you make a release in GitHub. If you want to have more control of the metadata in CaltechDATA, you should add a codemeta.json file to your GitHub repository. You can see an example in one of our library repositories, which generates a CaltechDATA record that includes multiple authors with ORCIDS, custom keywords, and license information.